Berkley® Trilene XL® Smooth Casting Line – 330-Yd. – Clear: Super strong, extra-limp Berkely Trilene XL comes off the spool smooth and straight. You get long, accurate, controllable casts and natural lure presentation with this ultra low-visibility line. Rapala® Original Floating Lure: The Original Floating Rapala can be fished using a steady retrieve, stop-and-go retrieve or as a twitch bait. No matter how you fish this classic bait, it's guaranteed to bring 'em running. This lure has proven itself in a variety of conditions over the years. Per each. Mepps® Plain Aglia® Spinners: No other lure has caught so many record fish. No. 0 and No. 1 are perfect for trout, perch and panfish. No. 2 Aglia is ideal for large crappies, while Aglias in sizes No. 3 and No. 4 are irresistible to both large and smallmouth bass, salmon and steelhead. Northern pike and musky are quick to nail a No. 5 Aglia. Per each. Joe's Flies Hot-4-Trout Kits: Entice, hook, and land trout, bass and panfish on light spinning tackle like never before using Joe's Flies deadly spinner-fly combinations. Exclusive trailing treble hook dramatically increases hook and hold capacity. Switch patterns in seconds with patented EZ Exchange™ feature. 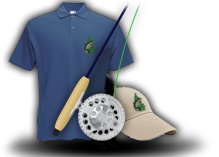 The kits include proven patterns to match the hatch or natural food sources for a wide variety of fishing situations. Northland® Mimic Minnow® CurlyFin™ Lures - Per 6: The Mimic Minnow CurlyFin is the most realistic, versatile and productive soft plastic swim bait on the planet! It features a lifelike "holographic" Baitfish-Image™ body and seductive CurlyFin teaser tail that swims and wiggles to mimic a "soft and chewy" shiner minnow. It mimics a minnow and fools 'em! Per 6. Beadhead Crystal Bugger - Per 2: The best combination of flash, weight and motion to cause powerful strikes even from the most reluctant of trout. Imitates a large variety of insects and baitfish. Can be fished under a strike indicator, stripped or swung. Per 2. Just wanted to say thank you for another wonderful outing on the stream. The weather was excellent. Christine and Kathleen tore'm up again and left Dad struggling to keep up. Lost a few good ones. Mary really enjoyed the farm house and how quiet it was. All of us are very appreciative of your helpfulness and professionalism. Nestled in the beautiful and peaceful Allegheny Mountains of Craig County, Big Pine Trout Farm is a mere 25 miles northwest of Roanoke, Virginia. Running through Big Pine is Meadow Creek, a well-managed stream with many 2lb. + hard fighting rainbow trout. Enjoy this swift, challenging, and natural mountain stream where both novice and experienced anglers can hook into many wild and stocked trout in the course of a day. Bring your whole family for an outing you won't forget.